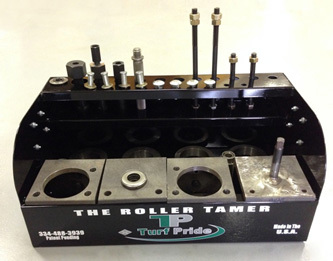 The Roller Tamer allows anyone regardless of skill level to quickly, easily, and properly rebuild cutting unit rollers without causing damage to the roller and without the headaches and frustration normally associated with this task. This patent pending device will assist with most types of rollers presently and formerly manufactured for the turf industry including water-pump bearing style rollers, tapered roller bearing type, radial ball bearing type, gang mower, basket rollers and others. Purchase a Base Unit then add the kit that best suits your needs for make and model of rollers to service. Call for prices or check with your local dealer. All Tamer components are interchangeable between models. Expand the capabilities of your Tamer by purchasing additional components when needed. Specifications subject to change without notice. OEM names used for descriptive purposes only. Turf Pride claims no association with them.